We have added 3 new sections to the website where you will find all the SPEAQ resources in French, German and Spanish. You will also find out more about LanQua and the Quality Model in the 3 languages. Although the SPEAQ project has now ended, you can learn more about it in the About and Partners sections of this website, and use the outcomes of the projects in the Resources and LanQua sections. ‘Engagement, Empowerment, Ownership – How to nurture the Quality culture in higher education’. 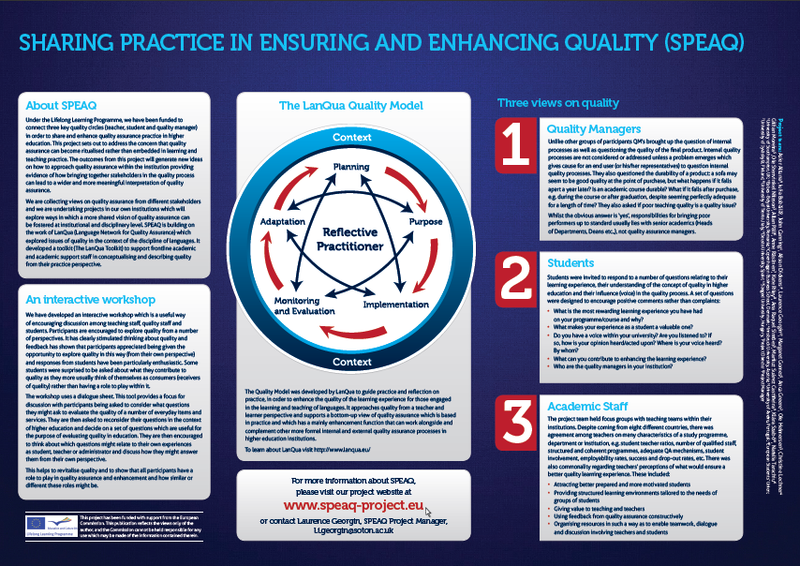 As part of SPEAQ, the 9 partners in European HEIs are developing initiatives to improve quality practice and culture within HE institutions. The initiative that we have chosen at the University of Southampton addresses feedback issues, which were raised in the first phase of the project by students, academic staff and quality staff. We have been developing online resources, which we will present to University of Southampton staff and students in the autumn through an interactive workshop. • Provide clear explanations of quality assurance processes and mechanisms at the University and how these relate to the feedback given and received by student. We have recently interviewed two dedicated members of staff: Bella Millet, Professor of Medieval Literature, who recently received an award for ‘student feedback’ at the Student Excellence Awards, and Simon Kemp, Principal Teaching Fellow, whose work was recognised through the award of a National Teaching Fellowship in 2010. Simon is also currently the national Academic Lead in Education for Sustainable Development (ESD) at the Higher Education Academy. Bella and Simon both highlighted the need for teachers to know their students in order to give meaningful feedback. Both also emphasised the value in giving verbal feedback to students which gives teachers a chance to explain their comments better and ensure that they are understood by students in the way they were intended. The full interviews will be available online soon. With a view to disseminate, and possibly replicate the SPEAQ student mentoring project within the Faculty of Letters, we organized a meeting with a group of first year students from other departments of the faculty, on April 11th, 2013. They belonged to specializations with different numbers of students, ranging from a dozen to more than a hundred, which would enable them to test their organization skills and the feasibility of such a project at micro and macro level. a list of the things they wished they had known before and during the winter exam period, with a view to adapting the information provided by the student mentors to the different stages of the university year. Tuesday Reading the timetable – why are the weeks called “odd” and “even”? Wednesday Where do I belong? Are practical course groups formed according to some alphabetical order criterion? Thursday How do I join and access the faculty libraries? Friday What are the credits and the contracts? How do I apply for a scholarship? The clearest signs that these students found the initiative useful and are eager to put into practice a peer-to-peer mentoring programme in their respective departments were the detailed questions they asked regarding the impediments we had faced and the fact that they shared the idea with their own teachers the very next day. We would be happy to witness an “upgraded” version of our initiative following next autumn. University of Trento, Italy – An aMEISing story! It was a slow start to the year at Trento, mainly due to bureaucratic hiccoughs: the institution of the Student-Teacher Committee, central to one strand of the mini-project at the School of International Studies (SIS) was delayed until February. Nonetheless, to kick-start the project, some informal meetings were held with the student members of the committee, all students on the Master’s in European and International Studies (MEIS). These students have taken their role to heart and had held meetings with all the students enrolled at the SIS to discuss quality issues. This enthusiasm met its reward first in early March with a formal meeting with the Degree Director, and subsequently on seeing some of their feedback and suggestions included in the first ever report to the newly created Italian QA Agency, submitted in March. The Committee finally met for the first time on April 29th. The second strand of the mini-project, focusing more directly on enhancing the experience of international students in the Italian HE context, is also well underway. Interviews in February with Quality Management and staff of the International Office and the Head of the International Student Welcome Office identified areas of improvement from the administrative point of view. In mid April a focus group for all international students enrolled at the SIS, EU and non-EU, was well attended and another meeting is fixed for mid May. Some of the issues raised by the students were in part due to a misunderstanding of the Italian HE system by international students or simply due to poor communication or lack of information. Others were of a more technical nature, but the exchange of information at least helped students understand why things are as they are! These projects, along with the students’ proposals for the MEIS itself, will be presented to all SIS students and staff at an open debate on 14th May entitled ‘Prepare to be aMEISed’.